As a fellow farm animal owner (or are we owned by them?) I often wonder - is that look of love or simply "why don't you go buy some alfalfa and fancy feed so our diet can be more interesting"! Thanks for being back to blogging - always good pictures and observations! I wonder if she's asking, "What mom? I don't get it." What a cutie even almost fully grown. 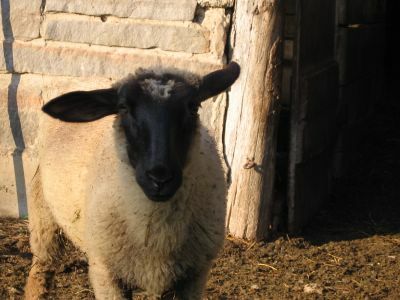 Okay, I love sheep. But I love most when I get the call from my mom on those early spring days that the lambs are being born and I hightail it out to the country. I just love that bewildered/bewildering look they give! I was wondering the same thing some of the other commenters are wondering: is it a confused look, a look of adoration, or a look that says, "Where my treat, lady?" well if that's Miss Cary she must be having a good woolly day.. She's adorable. I think she's saying, "Maaaahh, I need a baaaaath!" She looks like she's been rolling with Donkey Dan (speaking of, where's he been?). Not that it's bad to be a little dirty. She's sooo cute! I see that same look twice a day when I feed the dogs. LOL! I think they think I am only good for feeding and opening the door. Cracks me up. Cary is such a cutie. How are her and "new" ram getting along?? and ooooh the smell that lingers in the chill of the night!!!! :) I have to say that I find dropping by your blog a great comfort. I'm one of those people who WISH they lived on a farm (but in actuality, I likely don't have a CLUE as to how difficult it would actually be!) Thanks for your heartwarming and wonderful blog. Oh the wonder of weblogs...I get to visit your farm every day, watch the weather in your neck of the woods and smile at the animals! Okay I know this sounds crazy but I get that look everyday from our English Bull Terrier Winnie. I always think English Bull Terriers heads are so sheep like and this photograph has just about confirmed it. Yep, that's my little Carykins (but of course you knew that already, Yellow Dog). And that look? Well, for her it seems to be a very handy multi-purpose one. It can mean just about anything! Like I said, I get it a lot. The animals definitely own me! I am a Slave To Quadrupeds & Poultry. You're right--she does look like she's been rolling around with Donkey Doodle Dandy, and if I didn't know better I'd say she had been. I have no idea how she gets so dirty sometimes. One afternoon she went out with the flock for a few hours and came back absolutely covered with crushed dead leaves. They were all over her back! And everybody else looked fine. No baths for sheep, but yesterday everybody got a nice rain shower. So now Cary is dirty and soggy, LOL. Cary & the new ram are getting along fine, although she doesn't seem to have much interest in him unless he's wearing some food. (Yellow Dog, your comment about that photo had me LOLOL.) He, on the other hand, keeps giving her these once-over looks that say, "You're really cute, doll, but not 'til next year."